Work with one of Michigan's most trusted lawn care companies. Call Olson's Lawnscape today at 906-399-1718 to schedule service or get a free quote. One of our loyal customer’s reviews reads “I wouldn’t call anyone else for my lawn care needs.” But why is that? The Green Industry is definitely a fiercely competitive one and many contractors out there offer similar services. One reason why our clients choose us instead of the other guys is that we do indeed offer full-range, year-long lawn care and maintenance activities that cover everything from the first property evaluation to the last blade of grass we take care of. You will be absolutely thrilled with our services and our well-trained team. Every service comes with Jonas Olson’s Personal Iron-Clad, Risk-Free Guarantee. This means that if you are not happy with our work, Jonas personally will do whatever it takes to make it right… FOR FREE. If you still aren’t pleased, you don’t pay anything! There is nothing more important to us than your complete and total satisfaction. You want more reasons to hire us as your full-time lawn care and landscaping contractor? Take a walk around, talk to your neighbors and friends and learn what they have to say about us! Still not convinced? 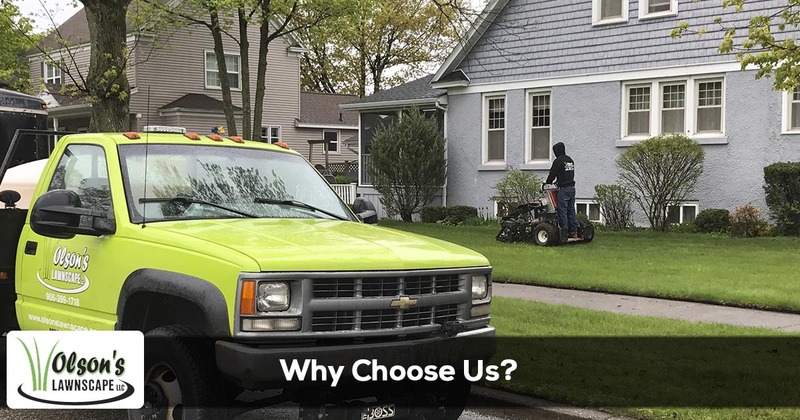 We are the highest rated lawn care service company in Escanaba and there are plenty of residents and business people in the area who can show you what we have accomplished for them. After all, our best business card is our clients’ lawns, gardens and landscapes. Our top quality and consistent work is backed up by our clear communication policy related to service expectations, reliability and prices, making them all the cornerstone of our success. We take the business and our clients very seriously, this is why our company carries all necessary licenses and certifications issued by the state of Michigan. We have specialists licensed in turf / pest management, fertilization, landscape architecture, environmental sciences, and so on. We treat your property as if it was our own. And when you have a bunch of strangers roaming around, you need to be fully ensured and have the peace of mind that everybody is safe. This is why we carry a $2 million insurance policy that covers all our employees and your entire property from the second they arrive to the second they close the gate behind them. We often noticed that similar companies fail to arrive on time when scheduled or don’t show their clients the courtesy of notifying them when they’re late. After all, lawn care is not quite an emergency, is it? Well, for us it is. We use advance mobile routing and scheduling software so we know where our crews are at all times. We make sure they arrive when you called them and if something happens, we notify you about the delays. Customer service is of utmost importance for us, just as it should be for any respectable business. Besides being fully transparent with our pricing plans and working only with respectable and respectful people, we are also there for you 24/7. You may require only one service a year or you can contract our services all year long. We treat each customer with the same deference. If you need guidance, our team members will answer all your questions no matter if you are a one-time client or a permanent one. Our 100% risk-free guarantee is an added benefit we offer all our clients no matter the job they require. We use a 21 point checklist on each of our visits to ensure that all gates get closed, all hard surfaces get blown from debris, the mowing direction is changed weekly and you are fully satisfied with each job, no matter it is a weekly or a seasonally one. We answer all calls and all emails and are recorded. We believe in communication and transparency, so we won’t keep you waiting or forget to return your call when you need us. You don’t, however, have to take our word for it. We love a good challenge, so call us today, ask for a free estimate and put us to the test! It’s risk free and satisfaction is guaranteed!